At an age when many competition dogs are nearing retirement, 9-year-old Hershey is just getting started. The chocolate pit bull has been in training since she was about 1 year old, and Hershey will make her debut in the rally ring this June. Hershey was recently registered with the American Kennel Club’s Canine Partners – a program for all dogs including mixes and breeds not currently recognized by AKC. As long as they are spayed or neutered, all dogs can compete in AKC agility, obedience and rally trials as well as the new coursing ability tests. 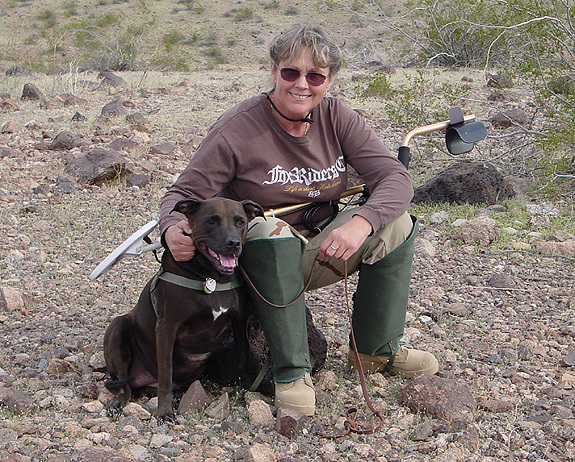 AKC events dominate the area were Hershey’s owner, Wendy Wooddell of Parker, Ariz. resides. This means Canine Partners opened many opportunities for them. “We have been practicing in rally for a few years now but just for fun. I was excited when I learned about Canine Partners and printed out the application forms the next day,” Wooddell said. Rally is a sport in which handlers take their dogs through a course comprised of signs that direct different obedience exercises, such as sit, stay and call the dog to front. Owners can talk to their dog and encourage them through the entire course. The AKC Canine Partners registration service started in October 2009, and competition launched in April 2010. Dogs registered through AKC Canine Partners compete head-to-head with the AKC purebreds for the same titles and awards and are eligible to qualify for AKC agility and obedience national championships and invitationals. 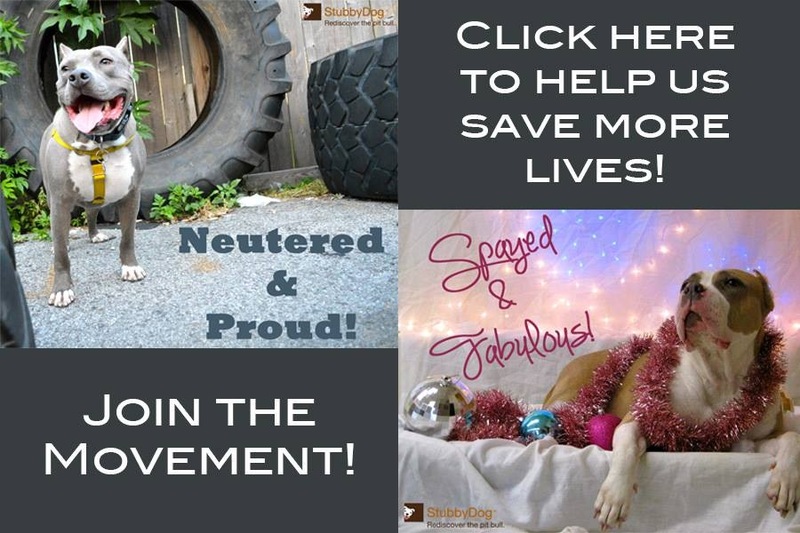 More than 1,000 dogs have already earned titles through the program. One of those dogs already succeeding in the program is a pit mix named Cooper, who now bears the AKC Obedience title of Companion Dog (CD). Cooper found his owner, Marc Powell of Nashville, Tenn., when he was just a 6-month-old puppy. 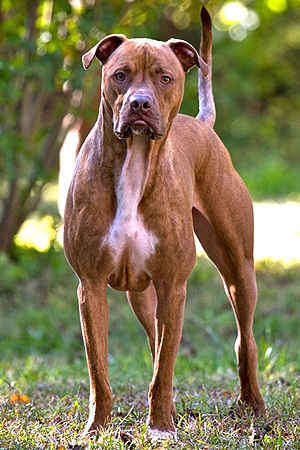 But Powell said he did have some concerns about the breed’s reputation. When Cooper grew to about a year old, Powell enrolled him in obedience classes with the goal of passing the AKC Canine Good Citizen (CGC) test. 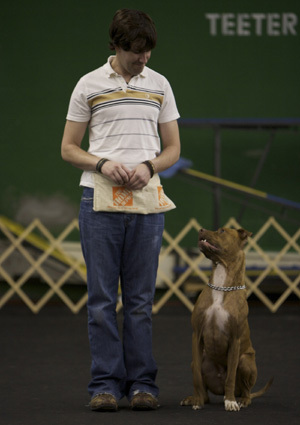 The test covers 10 basic steps of manners and obedience training. Powell continued taking Cooper to classes at the Nashville Dog Training Club to advance his training with no specific goal in mind. Members encouraged him to consider competition. Cooper debuted at the Nashville club’s trials on the first weekend of Canine Partners competition on April 3 – 4, 2010, and earned qualifying scores both days. He finished the final “leg” of his Companion Dog title in January. Not resting on his laurels, the 4-year-old dog is now training towards the next obedience title of Companion Dog Excellent and also the exciting speed sport of agility. “I like the obedience track because that keeps us on the ambassador path, but Cooper much prefers agility,” Powell said. High-energy dogs particularly love agility. It’s a sport that involves dogs running an obstacle course. The dogs jump, duck through tunnels, dodge weave poles and walk over seesaws. Morph already has a solid foundation in training as both of Copus’ dogs went into training as puppies and then followed it up with two rounds of family manners classes. 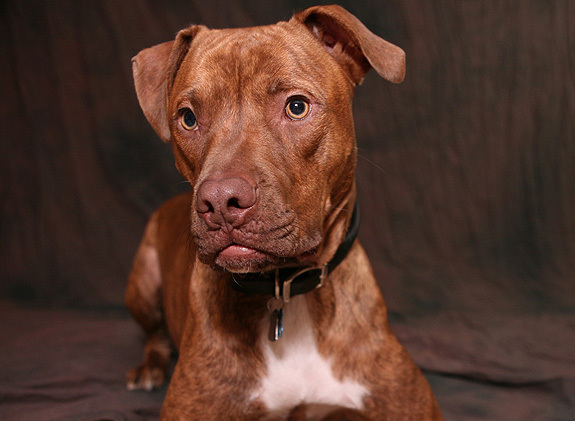 Powell agreed that training Cooper was not any different than training his other dogs, which are “non-bully” breeds. *AKC Canine Partners wants to invite Stubby Dog readers to enroll their dogs in the program at a discounted rate of $20. This is a savings of $15 off the regular fee of $35. The registration includes a free one-year subscription to AKC Family Dog magazine. To receive the discount, download and print the application and mail to: Penny Leigh, AKC, 8051 Arco Corporate Drive, Suite 100, Raleigh, NC 27617. For more information on the AKC Canine Partners program and AKC sports, visit the website. If you have questions, contact [email protected] or call 919-816-3749.